National Geographic Traveler rates this epic adventure in its "50 Tours of a Lifetime" and with good reason! Boundless Journeys’ Tour du Mont Blanc is a thrilling hiking circuit around Mont Blanc, Western Europe’s highest mountain. It combines the perfect mix of awe-inspiring mountain views and the vibrant influence of three distinct European countries—France, Italy, and Switzerland. 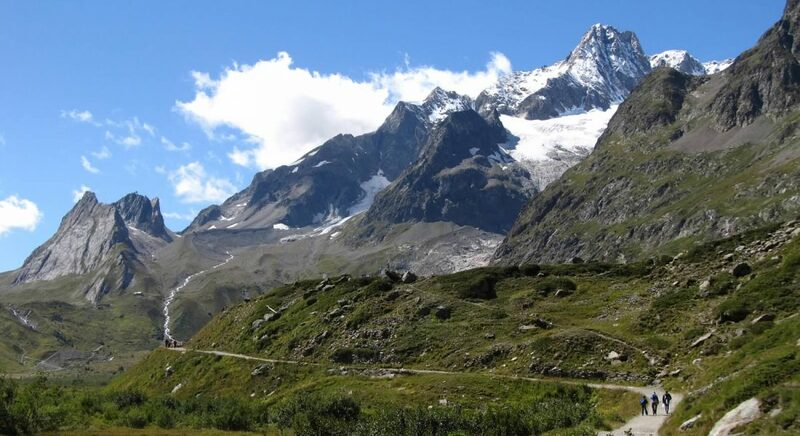 The hiking route leads us between small Alpine villages, over mountainous passes, and along ancient glaciers as we travel through the French, Italian, and Swiss Alps. Our expert guides will lead you from village to village as you dip down into a new valley each day and savor changes in language, landscape, architecture, and cuisine. Our cultural delights range from the French resort town of Chamonix, to the medieval city of Courmayeur, Italy, to quaint Alpine villages in Switzerland where you’ll enjoy delicious and hearty meals of local specialties. 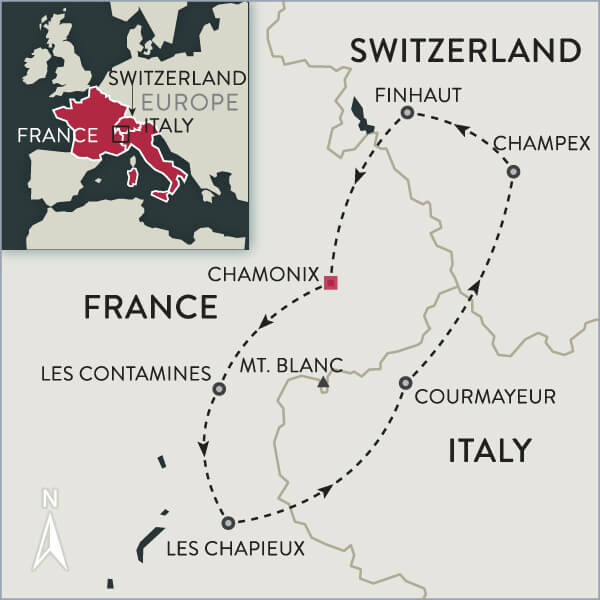 Join Boundless Journeys in Mont Blanc on this tour of a lifetime. Stopping for lunch with views of the Mont Blanc massif from across the valley at Lac Blanc in the Aiguilles Rouges. Descending into the Italy's Val Veny after crossing the border at the Col de la Seigne with views of the Aiguille Noire. 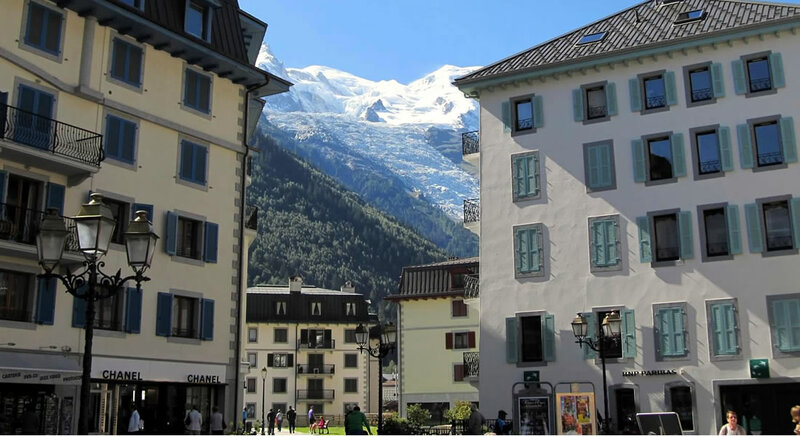 We meet at our mountain hotel in Chamonix, France, a pretty village nestled under the flanks of snow-covered Mont Blanc (15,770'), the highest mountain in western Europe. Chamonix is the 'mountaineering capital' of Europe, and has been a climbing and skiing center for more than 100 years. This wonderful town has a charming atmosphere and is well-preserved with cobbled streets full of lively sidewalk cafés. This evening, we have a trip briefing and welcome dinner. This charming Savoyard hotel is located just blocks from the pedestrian center of town, and offers incredible views of the Mont Blanc massif. Each room is of wood-carved, alpine chalet style décor. Start the day with a hearty breakfast featuring local specialty cheeses and meats and freshly baked pastries, and end the day with a dip in the swimming pool with Mont Blanc towering above. Today we join our guide for our first mountain hike along the "TMB" route in the Aiguilles Rouges, with Aiguillette des Houches as our destination. After a cable car to the nearby summit of Le Brevent, we enjoy a spectacular ridge hike above treeline along the Grand Balcony trail to the next summit of Aiguillette des Houches. This section of the Tour du Mont Blanc route presents a dazzling panoramic view of many of the highest peaks in the Alps, with spectacular vistas over the entire Chamonix Valley. We then descend along the gradually sloped trail to short transfer back to Chamonix to celebrate our first day's accomplishments. You are free to enjoy local fare this evening in one of Chamonix's many wonderful Savoyard (regional) restaurants. The Mont Blanc circuit starts a few miles outside of Chamonix at the village of Les Houches, where we take a cable car up to Bellevue. The hiking begins here, with fantastic views of the Chamonix Valley's peaks and surroundings. We first hike along the foot of the huge Glacier de Bionnassay, and then up to the Col de Tricot (6,955'), with sight of the Dômes de Miage. A steep descent brings us to the Chalets de Miage, where we enjoy a picnic lunch with the beauty of the Alps around us. Following lunch, we climb up the hill known as Truc, and then descend through a lovely forest to the charming resort village of Les Contamines-Montjoie, once a town of chamois hunters and smugglers, and today a popular mountaineering and ski area. Tonight there is time to explore the town, relax, and refuel for the next stage of our journey. 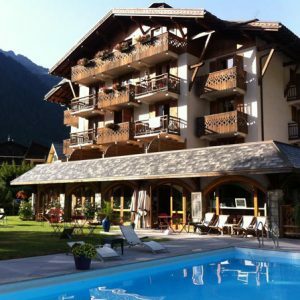 The Chemenaz is located in the small bustling resort town of Contamines les Montjoie. 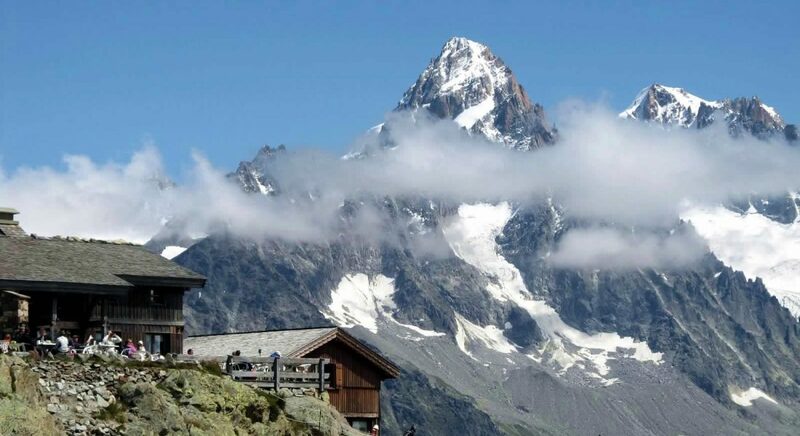 The hotel offers beautiful views of the "Domes de Miages" to the south of Mont Blanc, comfortable accommodations, and fine alpine hospitality. Relax after after the day’s hike in the swimming pool, sauna and jacuzzi. Enjoy regional Savoyard specialties in their restaurant La Trabla. In the morning we make our way to the end of the valley and our trailhead at the pilgrimage chapel of Notre Dame de la Gorge ' a church of unique Baroque architecture. From the church we walk along an old Roman road that climbs steadily through a beautiful forest, broad alpine pastures, and passes rustic chalets as we make our way to the Col du Bonhomme (7,600'), our first pass. After lunch at the Col du Bonhomme, a short, gradual uphill traverse takes us across Col de la Croix-du-Bonhomme (8,200'), with superb vistas overlooking the Tarantaise region. After a brief rest, we have a long and sometimes steep descent through rich, open pastures to the remote summer village of Les Chapieux (5,200'). A brief twenty-minute transfer will take us to our truly authenic Savoie hotel for tonight's stay. We'll enjoy a fine regional dinner at our guides' favorite local restaurant. Note: Today is one of the longest and most strenuous days on the Tour du Mont Blanc, as we cross two mountain passes, the Col du Bonhomme (7,600'), and the Col de la Croix-du-Bonhomme (8,200'). A beautiful stone lodge located in the small mountain resort town of Bourg St. Maurice. 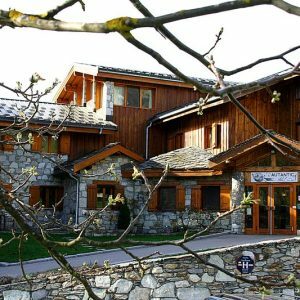 Located in a tranquil setting with a beautiful courtyard and garden, L’Autantic is a short walk from town, offering mountain views, pool and sauna, and authentic Savoie style and hospitality. A bountiful breakfast is served in the welcoming veranda, overlooking the eastern side of the Mont Blanc massif. We begin our day with a short transfer to the end of the Vallée des Glaciers. 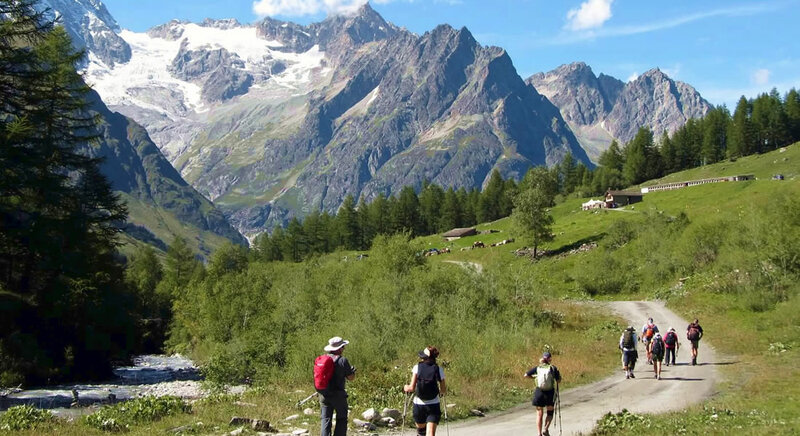 Leaving France, we hike into the Aosta region of Italy via grassy trails and ancient passages. We climb eastward and enjoy a relatively easy hike over the Col de la Seigne (8,245'). The views are dramatic from the pass, encompassing the Aiguille Noire and the Italian face of Mont Blanc that dominates the Val Veni. An easy descent brings us farther into Italy, and from the very first mountain refuge we pass, the cultural difference between France and Italy is striking. 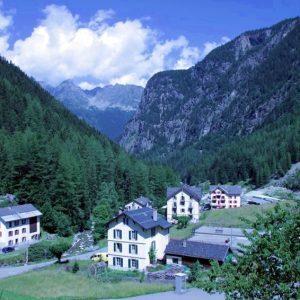 At the end of our day of hiking, we transfer to Courmayeur where we spend the remainder of the day exploring this resort town spectacularly settled beneath the Grand Jorasses and the Brenva Glacier. You are free to enjoy dinner this evening at one of Courmayeur's many fine restaurants. Hotel Berthod is a converted old country house in an ideal location in the center of lively Courmayeur, the "Italian Chamonix". The Berthod family who has operated the hotel for many years, embraces all guests with a gracious welcome and service. 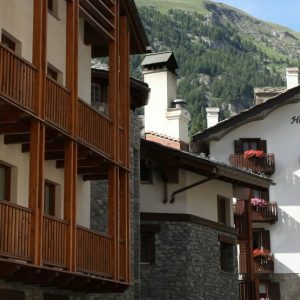 Balconies offer impressive views of Mont Blanc, and many shops and cafes are just a few steps away to immerse yourself in Italian culture for the evening. After a short transfer from Courmayeur, we hike from Italy into the mountain wonderland of Switzerland via the Grand Col Ferret (8,400'), and pass beneath the massive granite peaks of Mont Dolent, the Dent du Geant, and the Grandes Jorasses. We hike through alpine meadows and past fast-flowing mountain streams on our moderate but spectacular climb towards the pass, enjoying amazing views of the icy southern flanks of the Mont Blanc massif. The Grand Col Ferret has been in use for several centuries and serves as the Italian-Swiss border between Val D'Aosta and the canton of Valais. The landscape in the Swiss Val Ferret is gentler, with enticing streams and woodlands, and an extraordinary abundance of wildflowers. Our arrival in Switzerland is greeted by the sound of Swiss cow bells, and rustic chalets with geraniums spilling from window boxes. We descend to the village of Ferret, and transfer to the mountain-ringed lake resort of Champex. There is time to relax before dinner at our comfortable hotel. 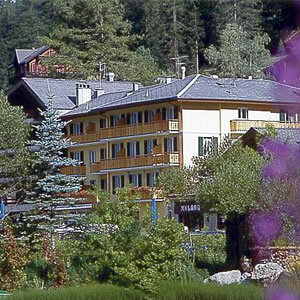 Hotel du Glacier is a family-run hotel ideally situated on Lake Champex, reflecting views of the surrounding mountains. Swiss flags and cows with ringing bells in the surrounding area will welcome you in Switzerland. The hotel offers a billiards lounge and opportunity to relax in the or hot tub after a full day’s hike. Experience the local culture in the small village, a short walk away, before savouring a regional Swiss dinner. Our hike today begins in the town of Champex along Bovine Way, an old trail used to access summer cow pastures high above the valley. After enjoying the morning light over the lake, we continue with a gentle walk through a spruce forest, which eventually brings us to Plan d'Au, where we may stop for a short rest. We then continue up the valley and, after crossing a number of streams, climb steeply to arrive at the flower-filled meadows of the Bovine Way. From here we have an expansive view of the Rhone Valley, the Muveran Mountain range, and mountains of Switzerland, reaching into the distance. 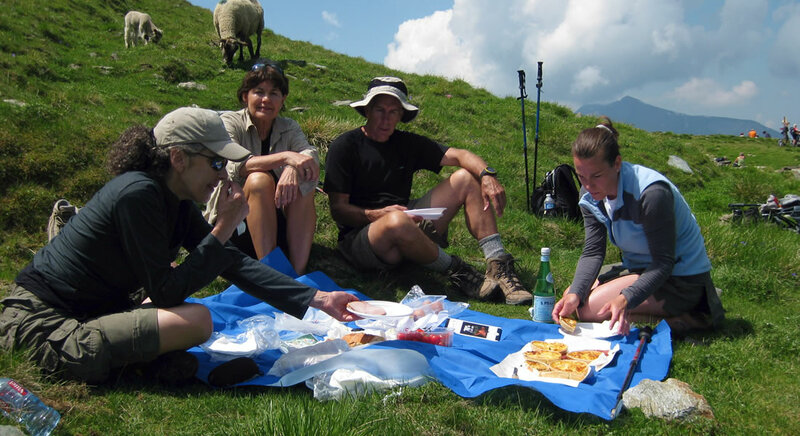 A perfect place for a midday picnic, we enjoy a delicious spread prepared by our guide while taking in the beautiful alpine scenery. Following lunch, we continue on through the forest and up along the side of the valley, eventually reaching Col de la Forclaz (5,000'). From here, we walk upstream following a bisse, one of the famous Swiss irrigation canals indicative of the area's rich farming history. We then drop down to the village of Trient (4,200') to our hotel. Our more simple hikers' lodging is superbly situated at the foot of the Trient glacier, and will have a hearty dinner awaiting. A simple alpine hotel located at the foot of Trient glacier. Recently fully renovated, La Grande Ourse offers modest and tidy accomodations, and fantastic views of the valley. Owned by a local family prioritizing excellent service. Bathrooms are in shared facilities by gender. Today we complete the Tour du Mont Blanc cuircuit on one of its most beautiful stages. Departing from Trient, we hike through high pastures and back into France over the Col du Balme (7,230'), with glorious views of Mont Blanc and the Chamonix Valley below. We have lunch at the pass, enjoying the sweeping views, and then descend by foot or gondola to the village of Le Tour, from which we head back to Chamonix. We gather to celebrate our accomplishments tonight with a farewell dinner in town. Our trip ends after breakfast, and you are free to continue your exploration of Chamonix, or depart for your next destination. Boundless Journeys' trips are designed for energetic and flexible individuals who like to be active and have a spirit of adventure and a positive attitude. As one of our most challenging tours, Tour du Mont Blanc Hiking is rated 4, strenuous, on a scale of 1-5 (5 being the most strenuous). As this classic route completely encircles the Mont Blanc massif, we trek full days through spectacular mountainous terrain, "inn-to-inn" every day (except for our first hike on Day 2). Each rewarding day includes long elevation gains and losses ranging from 1,700 to 4,400 feet; hiking duration ranging from five to eight hours, and mileage ranging from seven to twelve miles. Most hiking is at altitudes between 5,000 and 8,000 feet, and the maximum elevation reached is 8,800 feet. Although luggage is transported each day, the hikes have no vehicle access (other than the start and finish), with no shorter options. All trip members should be in strong physical condition and have good hiking experience. No technical climbing experience is necessary. (Limited passenger seats are available in the luggage vehicle in the event a transfer is needed.) We encourage you to call our office for further information to help determine if this trip is right for you. Trail conditions vary greatly, including a mix of wide dirt paths, hiking trails with rocks and roots, rough, large rocky steps, loose scree, and shallow stream crossings. Uneven terrain underfoot requires agility and stable footing. We request that you bring hiking boots with full ankle support and two trekking poles, which help provide comfort, stability, and most importantly, enjoyment. Our hikes take us through farmland, forest, rocky glacial terrain, and over mountain passes. Each hike includes sustained climbing and descending, sometimes steeply. The route does not travel through exposed sections with drop-offs, but does include limited sections of trail traversing steep hillsides, which may pose an issue for those with vertigo or a fear of heights. Feel free to call our office for further details. Your guide(s) will meet you in the evening on the first day of the trip, in the lobby of our hotel in Chamonix. Chamonix, France, after breakfast on the last day of the trip. Please note that transfers to the Geneva International Airport take approximately 1.5 hours. Please plan your flight schedule accordingly. In an alpine environment, weather is variable throughout the day and by elevation. A warm, sunny day in the valley can be anywhere from delightfully refreshing to downright brisk at higher elevations. Therefore, dressing in layers will be essential to your comfort throughout the day. Rain and snow are possible at any time, and weather conditions can change rapidly in the mountains, so having rain gear and thermal layers on hand is advisable. At the same time, the sun is strong at higher elevations, and therefore adequate precautions should be taken to prevent sunburn, even on cool days. Savoyard cuisine is centered around the incredible bounty of fresh foods available in the Alpine valleys of the region. You'll enjoy plenty of local cheeses and wines and most menus will feature soups, pasta, fish, meat, and salads. Breakfasts, lunches, and all but two dinners are included; your guide can make recommendations for wonderful local restaurants for those two evenings. 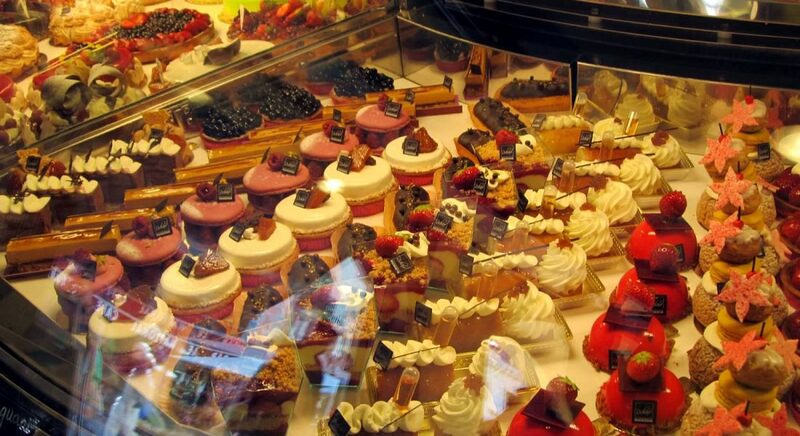 Breakfasts include fresh fruit, sliced meats and cheese, yogurt, cereal, and pastries. Picnic lunches usually include fresh fruits and vegetables, cured meats, fresh bread, 2 or 3 local cheeses, and cookies or chocolate for dessert. Most dinners are at our hotels and consist of a good variety of Savoyard choices. Vegetarians can be accommodated with advance notice, though choices tend to be more limited. The hotels we stay in are rustic, well-located for hikers, and busy in the summer season. Please note that these are hikers' hotels, not five-star resorts. The rooms are clean and comfortable, but are not always of uniform size, and amenities can vary. Although offering excellent service, the Hotel La Grande Ourse offers shared dormitory-style bathrooms (no private baths) and limited single rooms. Those who reserve a single room may be matched with another guest (of the same gender). 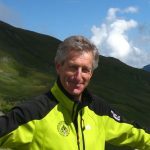 Born and raised in Chamonix, Eric comes from a long line of mountain guides and has led long-distance hiking trips throughout Europe, especially in the Alps, since he began guiding in 1979. Eric speaks French, English, Italian, and German, is an avid skier, and has developed great relationships with local people along the route. Eric is also involved heavily with the Valais canton, writing guidebooks and maintaining trail markings. He is very knowledgeable about all food, flora, and fauna in the region and is a great traveling companion with a lot of pride for where his roots have been for generations. Eric is warm and welcoming, and visitors can rest assured they have a fantastic leader who knows all the ins and outs of the routes. 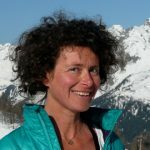 Sandrine came to Chamonix many years ago after being drawn to the dramatic mountains and outdoors lifestyle. She thoroughly enjoys leading trekking in the Alps, as well as organizing nature camps for kids. She has been working as a guide since 2001, and her naturalist’s eye on the trail opens our guests up to understanding the flora and fauna of mountains. Sandrine’s passion for the region’s culture and easy-going nature make her a great companion on the trail. She is known for her amazing picnic lunches and her individual attention to ensure everyone’s needs are met. Moderate to strenuous inn-to-inn hiking, 5-8 hours per day with daily ascents and descents of 1,000-4,400 feet.